I don’t know Eugene Buchanan, author of Outdoors Parents, Outdoors Kids, but I feel as though I do. He reminds me of certain men I’ve skied with, or hiked or climbed with, over the years. Before Buchanan became the father of two daughters, he was a classic over-achieving outdoors guy — and an outdoors guy who was making a living writing about his adventures. He paddled rivers all over the world and wrote about them as editor of Paddler magazine. He also worked as a ski patroller, raft guide, and kayak instructor. After his first daughter was born, his wife staged a photo for the birth announcement: a jumble of climbing ropes, surfboards, mountain bikes, skis, and kayaks with a giant For Sale sign sticking out of it. Buchanan soft-pedals his hard-core credentials in Outdoor Parents, Outdoor Kids. But his message is pitched to fellow adrenaline junkies, assuring them that they can continue to ski the deeps, paddle whitewater, and ride gnarly single-track, even with kids. This is both the book’s strength and its weakness. Buchanan narrates his family’s adventures in nine sports, one per chapter. Some would more aptly be called misadventures (the gear that got left behind, the ski trip that started with getting the car stuck in a snowbank). But all turn into fun, fun, fun and closer bonding between parent and child. Alongside the stories, Buchanan offers tips on gear (lots of gear) and games to play with kids. I can imagine Outdoor Parents, Outdoor Kids inspiring new parents who wonder if they’ll be able to continue their serious outdoors pursuits. It’s clear that Buchanan loves sharing what he loves with his children, and his pleasure is infectious. But it seemed to me that there was another, more interesting, and more reflective story lurking beneath the relentlessly go-for-it surface of the book. That story would include the perspective of Denise, Eugene’s wife and the mother of their two daughters. Denise Buchanan appears in almost cartoonish form in her husband’s book, usually as a voice of caution that her husband ignores, and occasionally in the form of a glare, which he also ignores. By ignoring his wife’s concerns, at least in print if not actually in real life, Buchanan misses an opportunity to explore a key part of outdoor parenting, and that’s how parents negotiate such potentially fraught issues as safety and limits. As a result, the book he’s written isn’t for partners so much as it’s for a certain kind of outdoor dad. 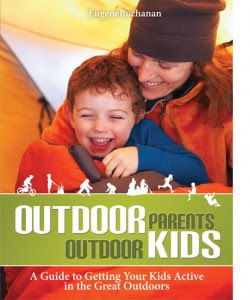 The Outdoor Parents, Outdoor Kids website.